An ice rescue team from Coast Guard Station Frankfort rescued a dog on Tuesday after it jumped into icy Betsie Bay in northern Michigan. 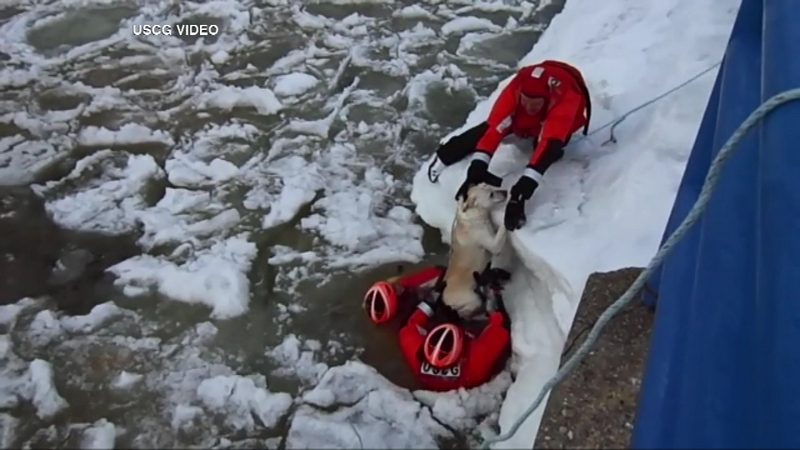 FRANKFORT, Mich. (WLS) -- An ice rescue team from Coast Guard Station Frankfort rescued a dog on Tuesday after it jumped into icy Betsie Bay in northern Michigan. A Coast Guard officer spotted the dog jump into the water and activated the search-and-rescue alarm. Wearing ice rescue gear, another officer swam about 200 feet to the dog. They were able to pull the dog to safety, and took him into the station's boathouse to be dried off and warmed up. The dog is doing fine now, but is being kept in quarantine until its owner can be located.